Moving of on a motorcycle requires that you take your own safety into consideration and that of other road users and pedestrians. 6. Now shift the weight of the motorcycle slightly to the left, put your right foot onto the footrest and apply the rear brake. The motorcycle is now prepared for moving off. It’s essential that you now perform safety observations before moving off. Check in front to ensure there are no pedestrians crossing the road or vehicles turning in front of you. 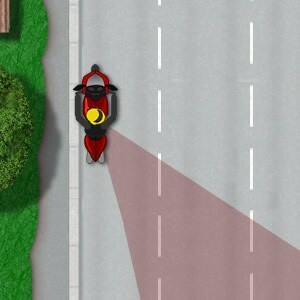 To check behind, you may check in your rear view mirrors if you wish (if fitted to your motorbike), but it’s essential that you physically look round to ensure there are no vehicles or cyclists approaching from the rear. You will need to judge the speed of any vehicles or cyclists approaching from behind accurately before moving off. If in doubt, wait. If it is all clear, you can release the brakes and gently apply the throttle to move off. If you have performed your rear observations and have decided to wait for vehicles to pass, remember to check again behind you before moving off. Indicating / signalling is required when moving off if this helps others to become aware of your intentions. This includes road users on the opposite carriageway and if there are pedestrians close by. Failing to signal where it may impact other road users or pedestrians may fail a riding test. It is not mandatory during a riding test to signal whilst moving off if there is no one around to benefit. In this situation, you may or may not signal, it’s simply up to you, though it may be of benefit to signal regardless so as it becomes habit. Remember to cancel your signal as soon as you have moved off as this may cause confusion to other road users.